Refugees from Bhutan and Burma work plots in a community garden that sells to Nashville farmer's markets and restaurants. "So we drop them in the fryer for about 90 seconds," she says. "You want them to blister but still have a lot of crisp." These are shishitos, a Japanese pepper with just the right balance of sweetness and spiciness, says Benefield. Most — but not all of them — are mild. "We say, like every one out of 10 is hot. When you get a hot one, it's kind of super-crazy hot." A great appetizer to go along with a steaming bowl of ramen soup. Benefield serves them with a Caesar-like dressing and croutons. "It's just a lot of fun and creamy," she says. "And it's kind of a roulette, too, which is a lot of fun." Chef Jess Benefield shows how shishito peppers are fried to create a popular appetizer at Two Ten Jack restaurant in East Nashville. But keeping shishitos on the menu has been work. It's possible to find them in Asian supermarkets and to order them from restaurant supply companies. But Benefield says those sources aren't always dependable. Or the peppers are low-quality. Or they may have been shipped halfway around the world. "So anything that we can get that's similar here, and that people are familiar with growing — It makes a lot of sense," says Benefield. Nashville's flourishing food scene has meant an explosion of styles and flavors. But finding the ingredients for those creative dishes is often a challenge for chefs. 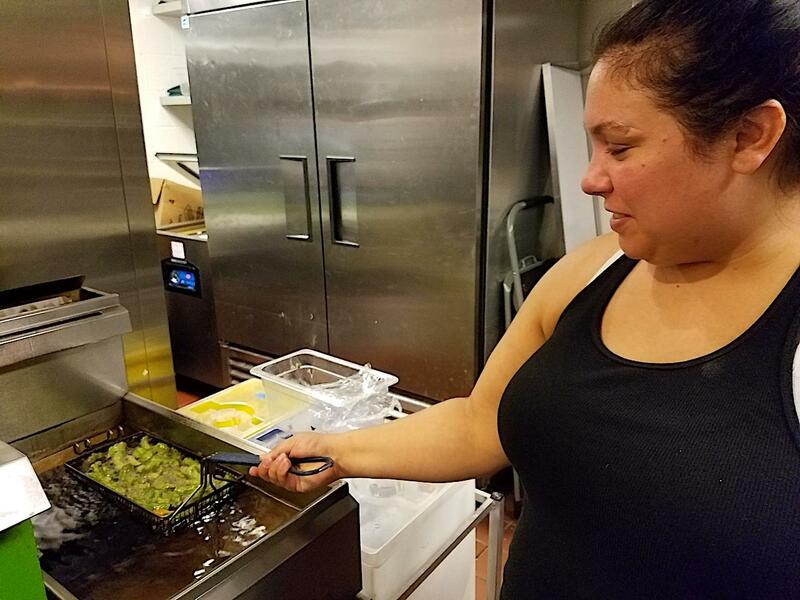 One program, though, is connecting hip restaurants with a group that has firsthand experience growing those crops normally found abroad — refugees. Just 12 miles down the road, in South Nashville, a community garden has been set up on the remnant of a church baseball field. This is where Chandra Poudel is tending his plot. He's taking part in a program called Growing Together that's now in its third season. Organized by the Nashville Food Project, the program encourages refugees living in the city to go back into farming. 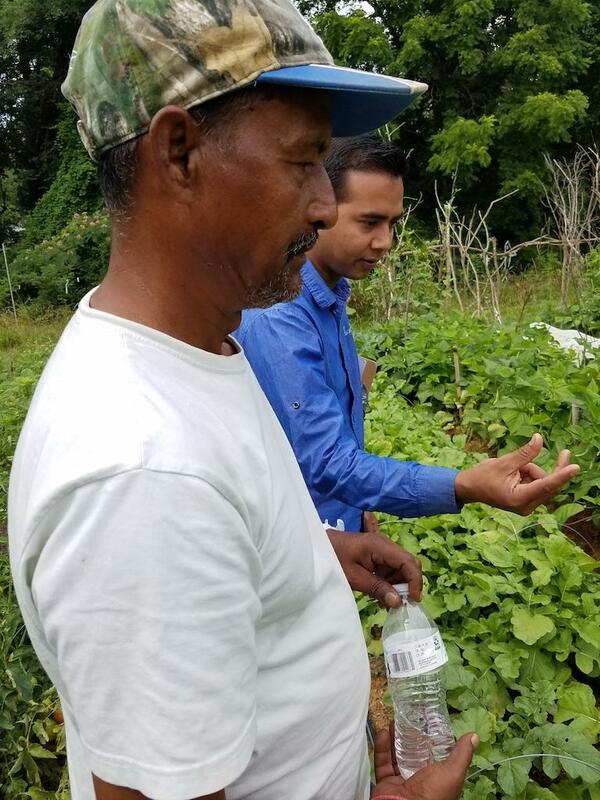 Chandra Poudel and translator Siddi Rimal, who is also a refugee from Bhutan, examine his crops in the Growing Together community garden. Poudel grew up in Bhutan but was forced out in the 1990s by an ethnic purge. For two decades after that, he lived in a refugee camp in Nepal. Then, that country's government shut the camps down, forcing him to resettle in Nashville four years ago. "Being a farmer is the best thing to me," he says through a translator. "And I like working, you know. Just whatever the work I have here, I just enjoy working here." Poudel strolls along his rows, pointing out the crops. His plot is vibrant and well-thought out. Some are plants he grew in Bhutan. He says he tended just over 5 acres there on a farm that turned out potatoes by the ton. The growers also raise food for their own use and to sell at a local farmer's market, says Lauren Bailey, the Growing Together program's manager. 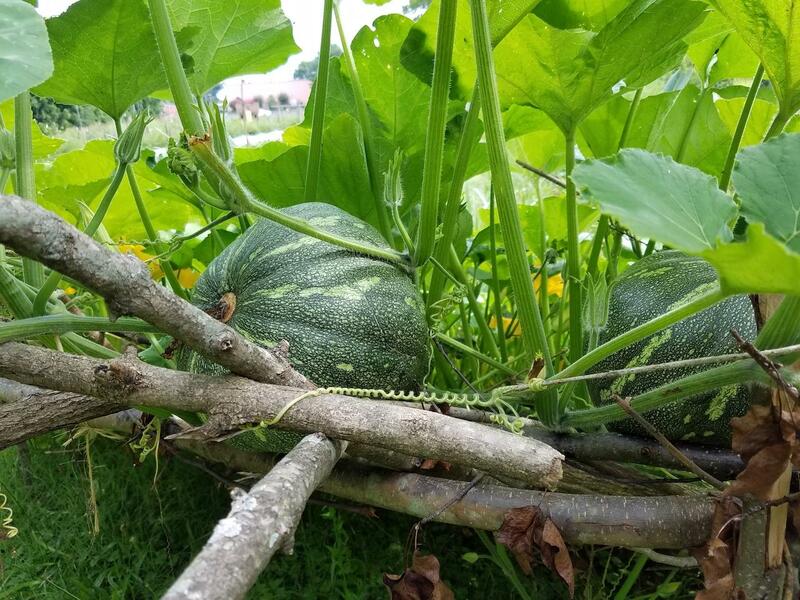 A Japanese pumpkin ripens on the vine in the Growing Together garden. Bailey says there are similar programs in other cities, including a thriving CSA farmed by refugees in the Atlanta area. Nashville's program is still in its early stages. There are eight farmers, each of whom gets 1,200 to 2,400 square feet. That's smaller than a tennis court and, Bailey admits, not enough land for farmers to earn a living. Growing Together would like to acquire more space, but as it stands, she says, participants do get a chance to work, practice English, earn a little money and build confidence. By producing the flavors found thousands of miles away, they hope to close the gap between Nashville and abroad. 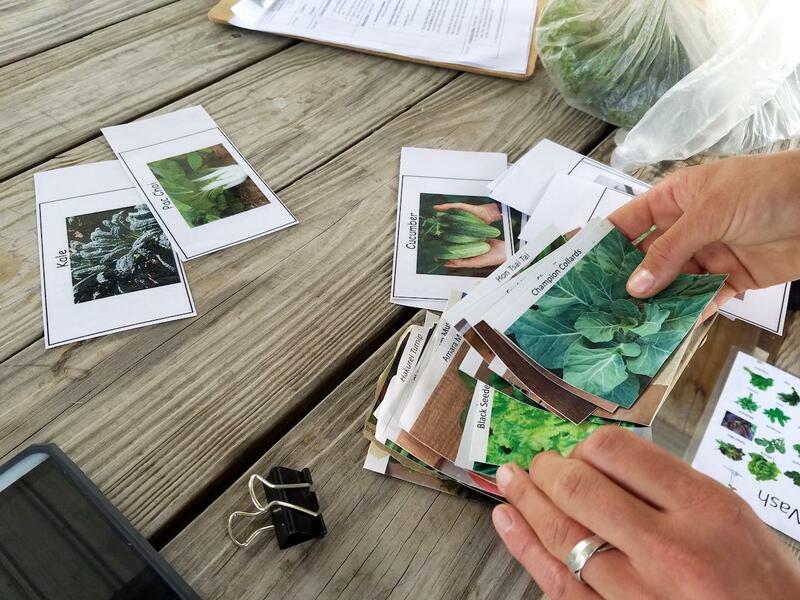 Because the names of plants vary across languages, organizers of the Growing Together garden often use flashcards to communicate with farmers. Tennessee lawmakers have followed through on plans to sue the federal government over refugee resettlement. The move comes at a time when organizations in the state are already cutting back on services for asylum seekers. The suit was filed Monday in a federal court in Jackson by the Thomas More Law Center, a Michigan organization that says it aims to defend and promote "America's Judeo-Christian heritage and moral values." The center did so on behalf of the state of Tennessee, the General Assembly and two lawmakers, including state Sen. John Stevens. The Huntingdon Republican says the key issue is whether Tennessee should have to spend money on programs it hasn't approved. Nashville’s agencies that resettle refugees have taken a hit since the freeze imposed by the Trump administration. Catholic Charities had to lay off a dozen employees, and the nonprofit World Relief is closing its local office. Yet the refugees who already live here are still seeking their assistance. So the client base has ballooned at nonprofits like Legacy Mission Village on Nolensville Pike. A new poll of Tennesseans finds that they are almost evenly divided on several questions about immigration, refugees, and President Donald Trump’s attempt to create a travel ban from seven majority-Muslim nations. Metro Schools plans to spend heavily on non-English speakers in the coming year. Immigrant students were a focus of superintendent Shawn Joseph's first "state of schools" address.